NEW DELHI : Appearing for Kerala government on Sabarimala row, senior advocate Jaideep Gupta says that exclusion of women is "not essential to Hindu religion". "Essential practice of religion and essential practice of a temple cannot be confused. The Supreme Court found that the practice was not an essential practice of Hindus," he adds. 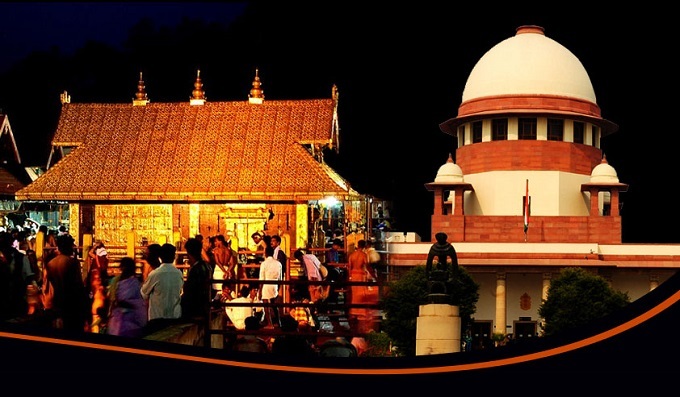 The apex court is hearing on pleas seeking review of its verdict which had allowed women of all ages entry into Kerala"s Sabarimala temple. Senior advocate K Prasaran, appearing for Nair Service Society, opened the arguments before a five-judge bench and sought setting aside of the verdict. The review petitions are being heard by a Constitution bench comprising Chief Justice of India (CJI) Ranjan Gogoi and justices R F Nariman, A M Khanwilkar, D Y Chandrachud and Indu Malhotra. There are 64 cases being heard in total, out of which some are review petitions and some transfer petitions. On September 28, a five-judge Constitution bench, headed by the then CJI Dipak Misra, in a 4:1 verdict had paved the way for entry of women of all ages into the shrine, saying the ban amounted to gender discrimination. The verdict had led to massive protests in Kerala and triggered a political slugfest between the ruling CPI(M), the BJP and the Congress. On November 13 last year, the apex court had agreed to hear in open court in January this year the pleas seeking review of its verdict, but had refused to stay the judgment. However, on January 22, the top court had said it may not start hearing the pleas, seeking review of Sabarimala verdict till January 30 as one of the judges of the bench, Justice Indu Malhotra, was on medical leave. Justice Malhotra, the lone woman judge in the bench, had delivered the dissenting judgment in the case last year. The two women, who had eventually managed to enter the temple in January and have since been threatened and even allegedly attacked, moved the Supreme Court on Tuesday, seeking to intervene as parties in support of its last September"s historic judgment. Two other women have also filed similar petitions. Reshma CV, Shanila, Bindu A and Kanakadurga, hailing from Kerala, have filed applications seeking to be heard as intervenors. They are supporting the verdict. Of the four, Bindu and Kanakadurga, aged 44 and 42, were the first to have stepped into the hallowed precincts after the top court lifted the ban. The other two applicants -- 33-year-old Reshma and 29-year-old Shanila, had twice attempted to enter the temple, first on January 15 and again on January 19. However, they were heckled and prevented by some self-proclaimed devotees after which they had to discontinue. "There are thousands of women waiting for Darshan at Sabarimala and are awaiting the final outcome of the review petitions, when this court would be pleased to hear and finally decide. The applicants may be permitted to intervene and make their submissions before this court when the Review Petitions are heard by this court, in order to oppose the Reviews," said Reshma and Shanila in their application. Bindu and Kanakadurga, in their application said, "The judgment of this court on September 28, 2018, upheld the dignity, liberty and equality of women of all ages and sent a strong message to the society against menstrual taboo. Proposed intervenors pray that they may also be heard to oppose the review, in case this court is inclined to review the judgment. It is in the interest of justice that the Proposed Intervenors are heard". On Monday, the CPI(M)-led Kerala Government had retracted from its earlier statement in Supreme Court that 51 women of menstrual age had entered the Ayyappa temple, and said it had proof to show only two women actually entered the shrine. Kerala chief minister Pinarayi Vijayan’s determination to facilitate women’s entry into the temple triggered a political war, but he has maintained he is only following the SC directions.